MyBinding is proud to carry the entire line of GBC BadgeMates ID supplies and ID accessories. GBC is absolutely the best in the business. Whether looking for BadgeMates lanyards to hang credentials around your neck or retractable badge reels that allow access of your card on demand, we carry them. In addition, we even stock the GBC BadgeMates badge laminator kit and a selection of cardholders, credential holders, and identification badge holders. 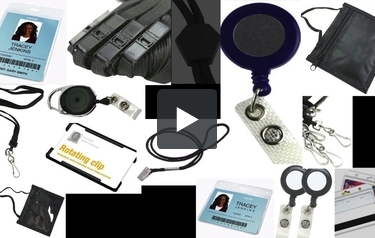 These accessories can be implemented along with your GBC pouch laminator allowing you to construct high quality, attractive, personal name badges in mere minutes. GBC accessories are fun and get the job done. Crystal clear and either vertically or horizontally oriented. Sold in packs of 10, 25 or as part of one of a GBC BadgeMates ID Badge Kit. This is MyBinding video. Here at MyBinding.com, we are proud to carry the entire line of GBC badgemates, ID supplies and ID accessories. Whether you’re looking for badge mates, lanyards to hang IDs around your neck or a retractable badge reel ready to pull out your card on demand, we carry them all, plus we even carry the GBC badge mates badge laminator kit. It has everything you need to get going. We have a great selection of card, credential and ID badge holders. These ID accessories can be used along with your GBC pouch laminator or any pouch laminator, allowing you to create high-quality, eye-catching name badges in just minutes. Consider using them inside your organization, business, event or church and see just the difference that GBC badge mates can make. We’ve got hundreds of how-to and demonstration videos on all of our products, and be sure to download the badge mates templates for quick and easy custom badge inserts. When image matters, MyBinding.